Motherwell manager Stephen Robinson has denied having a verbal exchange in the Fir Park tunnel with Celtic skipper Scott Brown in the Fir Park tunnel at half-time on Sunday. 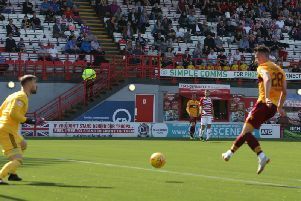 Brown appeared to strike Motherwell defender Cedric Kipre before Kipre retaliated by aiming a kick at Brown - which TV replays showed didn't connect with the midfielder - and was then controversially sent off by referee Craig Thomson. "I think everybody in the room knows it wasn't a sending off," Robinson said. "I know you all know that. Two people burst together. If it had been two yellow cards out of it you might have thought it was harsh if I'm being honest. "Scott Brown gives him a little shove, Cedric brushes his calf against him and I've seen it this time so I'm 100 per cent certain of that. "But it definitely wasn't a red card, that I know. "Everybody in the ground knows and it spoilt a very, very good match. "I didn't need to make my feelings clear to Scott Brown in the tunnel. It wasn't Scott Brown that made the decision." Robinson said that Motherwell would look at appealing the decision as "it certainly wasn't a stamp" by Kipre. "We'll sit down with the powers that be, me and Alan Burrows, and speak to the board and see where we take it. "Five red cards from the same referee and he's not sent another Premiership player off this season. You take out of that what you will, I'm not saying anything. "I don't think Scott Brown should have been booked and I don't think Cedric should have been booked. It was nothing." Robbo was delighted with his team's display in adversity. He added: "To a man, I was absolutely proud of every single one of them. "I thought we were excellent in the first half. I was coming in at half-time to say, 'Just more of the same, you'll win the game. "We were the team on top, playing all the football and had chances. And then the game turns on its head with a decision. "But the way they battled, the organisation. It's ok me organising it but they took me to absolutely the last word that we said at half-time and they followed the instructions completely and maybe could have nicked it at the end as well so I'm so, so proud of them. "It's annoying because people pay money to watch the game and it was a really, really good game of football. I thought we were taking the game to them. Most people sit off Celtic we didn't."